I found this picture on an interesting site. Not sure who done it, there is another at the bottom of the page. So my plea for games worked... I've been sent 39 games! Yup. Now don't interrupt again, I have 39 games to go through. This first game is a shorty with a lesson for beginners studying the opening. White has just played 9.Qf3 Which is known but at the time not to Black. Theory is 9.a4 when Black plays 9...g6. So what does Black do? He plays 9...g6 anyway. A little bit of knowledge is indeed a dangerous thing. move 9...g6 would never had entered his mind. White seized the weakened f6 and wrapped it up faultlessly. Black has to toss his Queen or get mated. into his XBOX 360. He plays silly shooting and football games online. all over the globe as they shift graphics around some virtual world. "Yoa a gaga lugga mullah hooba XBO." He lost the power to talk correctly the day he got his first computer. I am used to it so I will translate. "Hello Father, I have Chess on my XBOX 360, would you like a game?" a chess playing program for £9.00. You get a free 4 minute trial. I played it. This is what happened. I took a picture of the final position. You will see it took me 1 minute. Needless to say I declined the offer to pay £9.00. Games No.3 to 39 Will appear on another day. Last C.C. we covered this in detail. 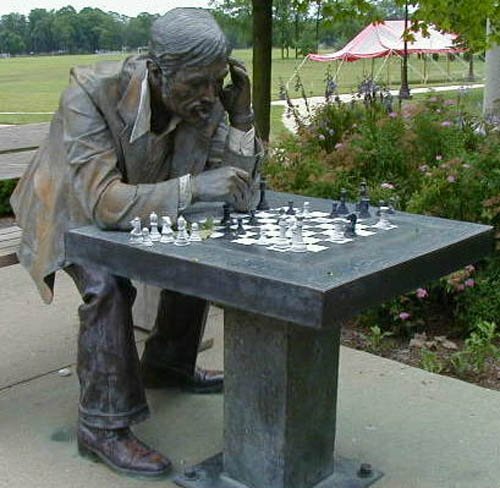 Roland Kensdale sent me a picture of the statue before it was vandalised. It appears to be in a different setting. Is there more than one? So the position before the vandal struck is this. With the bronze man apparently playing Black and in check. Not a position I recognise, Black should resign. I've tried looking for a hidden message in the position. Nothing. I cannot even determine what White's last move was. 1...Kg7 2.Rb1 Nc2 mate. But that is just silly and ugly. set up a position where Black was winning. Did you see this in the SUN on Thursday 7th September? Status Quo appeared on Celebrity 'Who Wants to be a Millionaire'. Q:How many Knights are there at the start of a game of Chess. A: Two?? (there are still four). and the show would have lasted 40 seconds. Fortunately for Quo it turned out they were given the wrong set of questions. then give the questions and answers to the celebs before the start of the show. This is so we do not see how thick our heroes really are. pre-programmed brains to get the correct answer. Exciting television eh? Quo went onto 'win' £50,000. I tell what makes me cringe. It's film premiers. to cheer on people going into a cinema. "They are going in to see a film...Hooray." And celebrity chefs? What on earth is a celebrity chef? He is a cook. Which is one up from a kitchen porter. Half the planet is starving and we have celebrity chefs. But I'll tell you who really infuriates me. What else has been happening...? Oh Yes. to do with Chess but I signed it as a monk called Ruy Lopez. Just so proper Chess players would know a fellow artist was in their midst. no one on the letters page staff is a chess player. give the whole thing. On Thursday 6th September this appeared. So I sent in a reply and the following day this appeared. Good Grief. I have now joined the ranks of the window licking firework clappers. I have taken a copy of a letter published in a newspaper and put it on a chess site. Finally another picture from that interesting site. Note the board the wrong way around. Must have been in a rush to set it up.